Sephora is the fastest growing and largest online prestige beauty retailer with over 2,000 stores worldwide in 30 countries. In the US, Sephora has nearly 400 standalone stores and almost 500 Sephora inside JCPenney locations. Consumers can shop for over 13,000 products from more than 200 skincare, makeup and fragrance brands like Urban Decay, Clinique, Dior, Benefit, Shiseido, Tarte and more. eGift and plastic gift cards are redeemable only for merchandise sold at Sephora locations in the U.S., at Sephora.com, through the U.S. Sephora App, and at Sephora inside JCPenney stores. 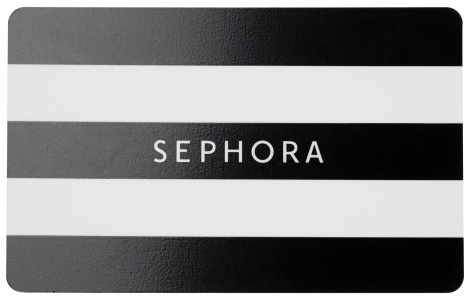 Plastic gift cards are also redeemable for merchandise sold at Sephora locations in Canada. Not refundable or redeemable for cash except as required by law. The value of this card will not be replaced if the card is lost, stolen, altered or destroyed. Does not expire. If your purchase exceeds the balance, you must pay the difference. You may not add value to an eGift Card. Card is issued by and is the obligation solely of LGCS Inc. You expressly release Sephora USA, Inc. and its affiliates other than LGCS Inc. for any and all liability with respect to this card. Complete terms and conditions are posted at http://www.sephora.com/giftcardterms. Purchase, use, or acceptance of this card constitutes acceptance of its terms and conditions, which may change. For store locations, orders, or card balance inquiries, please visit http://www.sephora.com or call 1- 888-860-7897. 2017 LGCS Inc. All rights reserved.